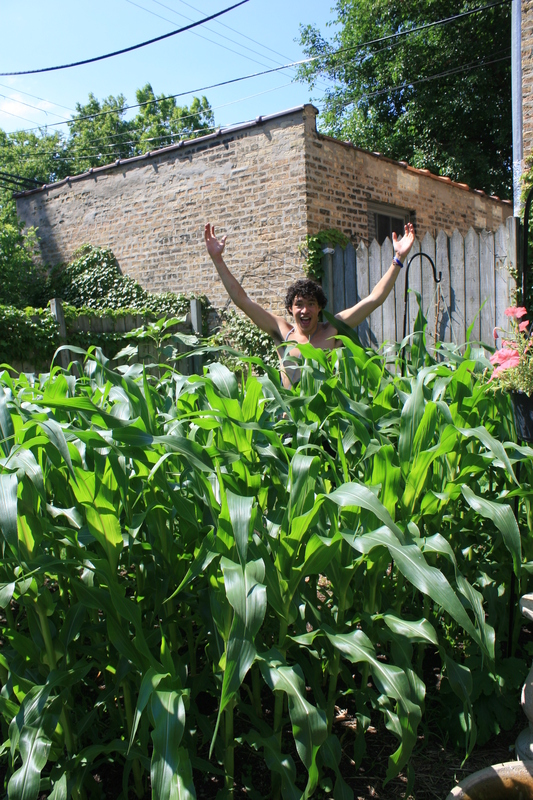 LETS GO Chicago members have been lovingly growing thousands (yes thousands!) 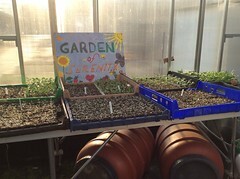 of fruit and vegetable seedlings in our Rogers Park greenhouse at Westwood Manor Nursing Home and we are so excited to share them with you! 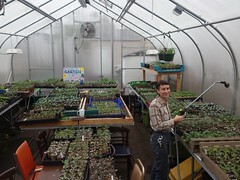 Come to our seedling sales this weekend and next weekend! Join us for the 2014 Chicago Summer of Solutions! Hello Everybody! My name is Kendra Keyes and I’ve been working with Summer of Solutions since the summer of 2013. I was a volunteer and could come and go to the program with flexible hours fit to meet my needs. 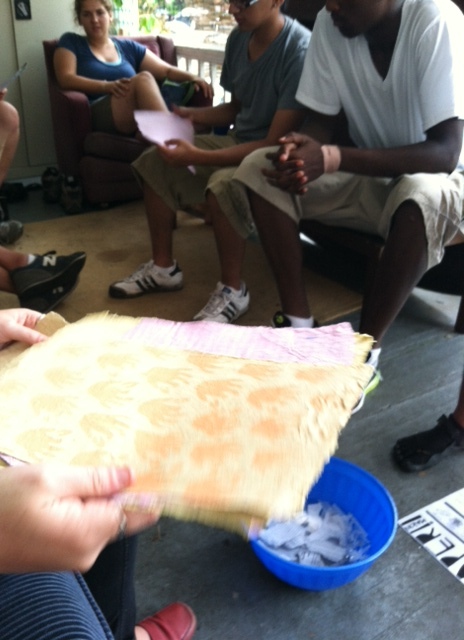 It was the perfect summer learning opportunity! I worked on the Yard Sharing team, and got to build these relationships with my team members as well as with a big beautiful garden and all its inhabitants. 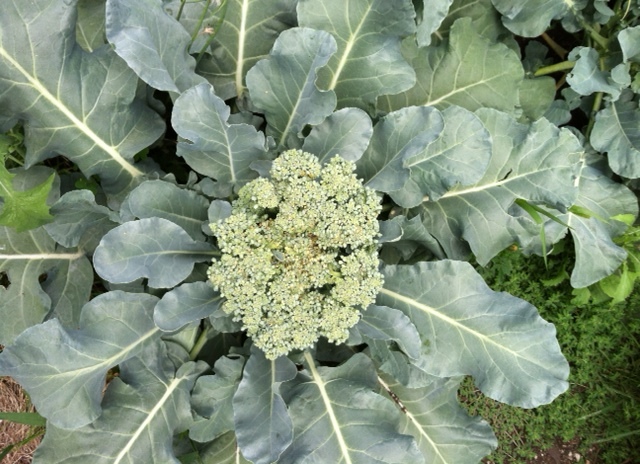 We got to know the community through our CSA garden and field trips to the farmers market or local bike shop or even the beach. Before I knew it, I felt I was with these people and in this community more than I was with my own. Everything we talked about was interesting and every project we did was enlightening and extremely relevant. We are looking for people who are interested in things like energy efficiency, community-based energy, green industry, and local food production, to join our team this summer and have a similar experience! The deadline to apply is April 11th. Apply now at http://bit.ly/applychicago. I have been working with the team throughout the winter while I have been away at college. 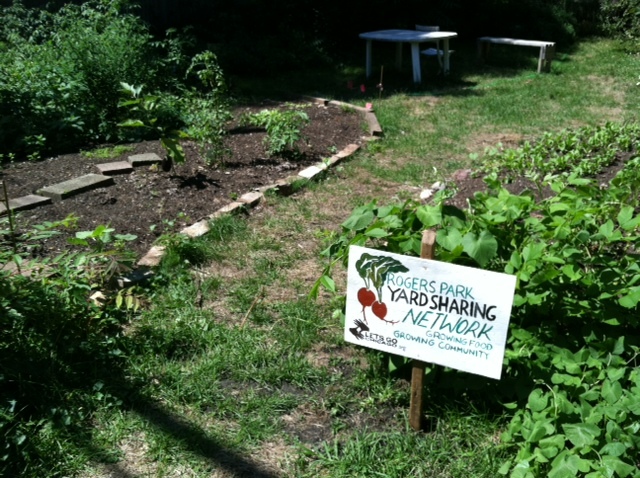 This summer I plan to be a program leader and work with the yard sharing network. I can not wait to see what 2014 has in store for Let’s Go Chicago! OMG Corn is so big! So seriously, the garden has been the most exciting working group ever ALWAYS. But this week especially, things have gone NUTS. Before my eyes an epic opera of life and death, of vegetable and gardener, of difficulty and triumph has slowly unfolded. We’ve been pulling in beans on beans, squash is shooting out of the ground left and right, and the first dark purple blobs hinting at future eggplants have appeared. Despite this, not everything in the garden bodes so well. 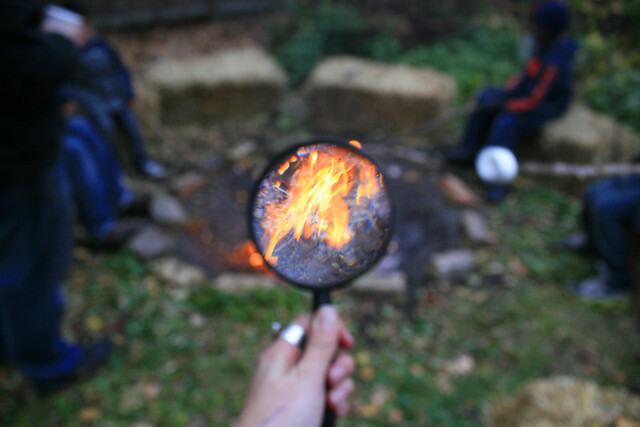 Through the lens of a Yard Sharer… food, fire, magic, and community. Our work on reclaiming Place. With the arrival of November and all its triumphant color, calm, and hints of frost, so comes the end of our second season as Yard Sharers. We celebrated the closing of another beautiful growing season with a bonfire, soup, and hot chocolate at our friend and land lender Bob’s house. 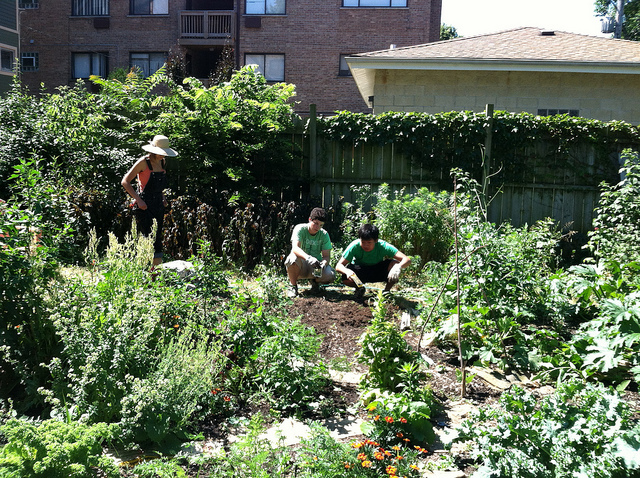 This year we were able to expand our Rogers Park Yard Sharing Network from 1 to 6 back yards and expand our gardener population from one learning program (us) to around 25 new growers. Hey everyone, Im Jason from the Rogers Park area. I am a member of LETS GO Chicago and i’m here to explain to everyone about what we did this wonderful summer. At first, I thought it Summer of Solutions going to be extremely boring ,since all we did was discuss problems about the world around us. I thought myself, “This was not what I signed up for”, but after our training week was completed, we were ready to get some work done. As a team we all started constructing raised beds on the first day. At first, i felt nervous since i didn’t talk to no one, let alone build with them. But since these were all good-hearted people, everyone got along in an instant. Even with the humid air and harsh sun, nothing could’ve stopped us, because we were committed! 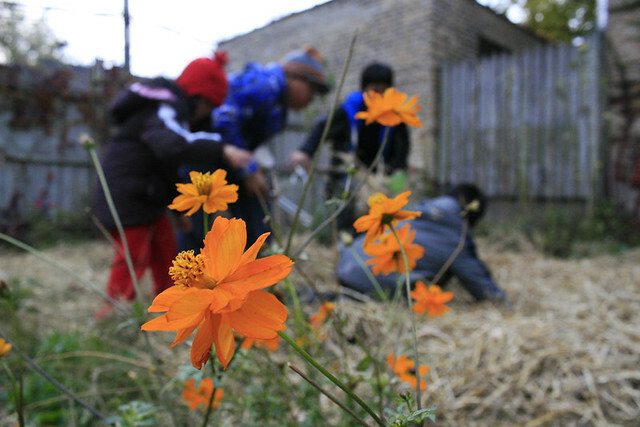 We also had a program for kids that was called “Childrens Garden” in which kids from around the neighborhood would come to learn about gardening and have fun projects to do that involved face painting, tea making, transplanting, etc. 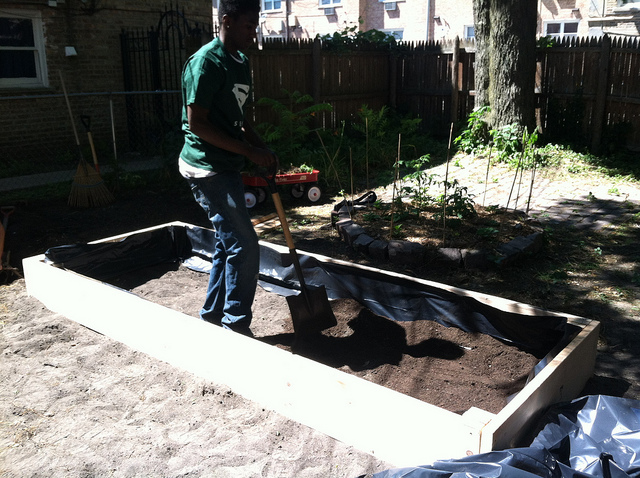 Kids were also able to have their own raised beds to grow their own crops. We taught them about the soil and how to properly space their seeds so they can grow comfortably. 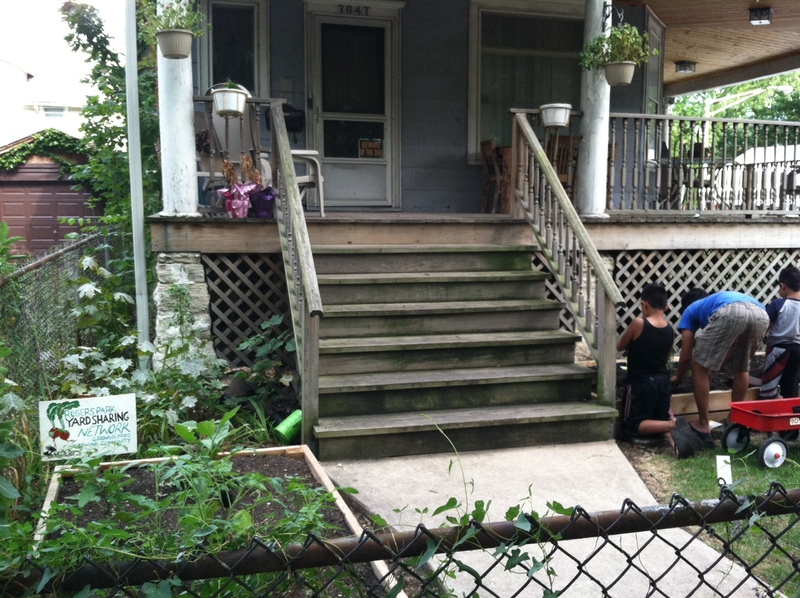 As you see here we have 2 brothers from Childrens Garden planting their seed sand watering them, as well as Greg (who is a member of Summer of Solutions) helping them out. Hopefully by next year ALL of our lovely gardens will look like this, maybe even better! 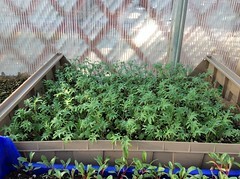 With the end of the summer coming into view, our seedlings are long gone and the harvest is nearly here. The garden is full of life, and this week we’ll be completing this summer’s planned gardens. 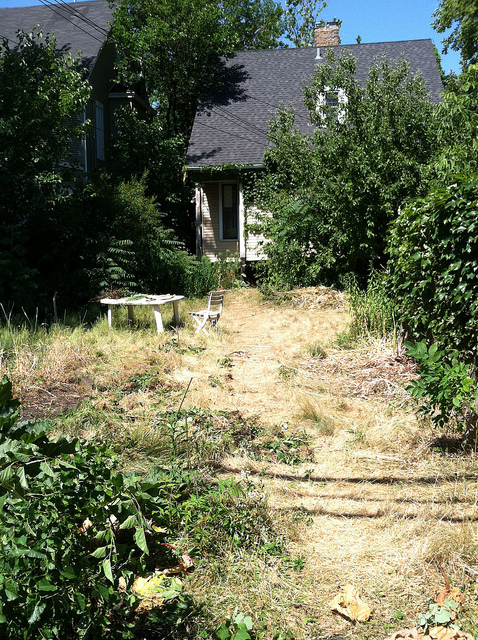 We’re currently tearing up the grass on a front lawn on the 6700 block of Ashland, so if anybody has seen the construction, yep, that’s us. 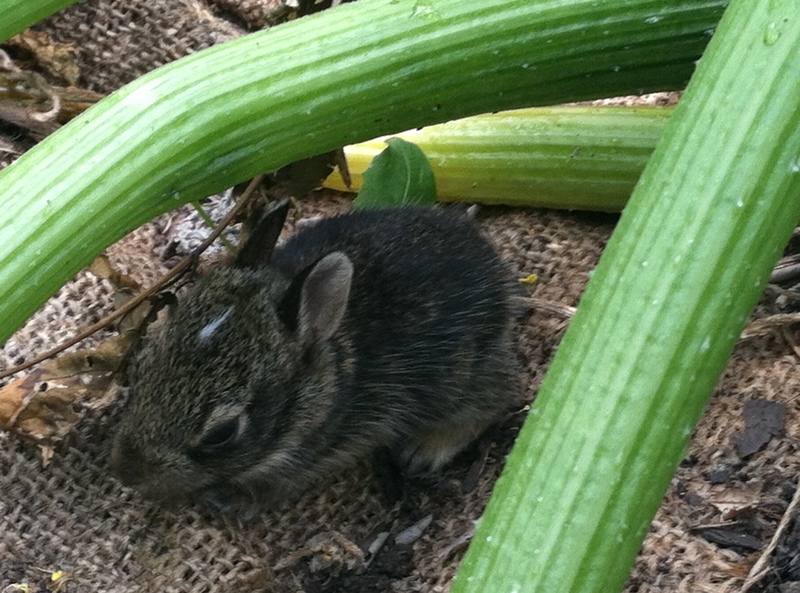 At least three baby bunnies have been sighted in our ‘home base’ Bosworth backyard garden, and they’re almost too cute to consider them a pest. This week we’re learning about bee keeping, so stick around for the inside scoop! 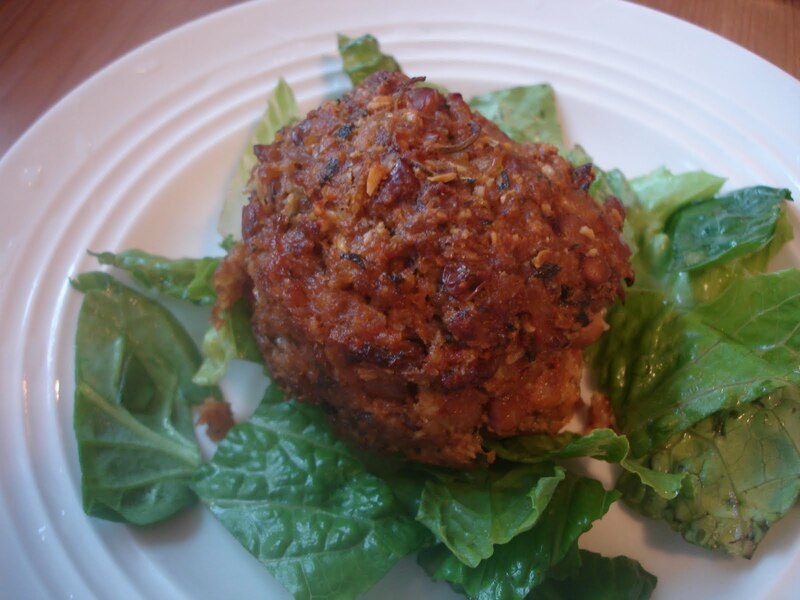 Ever had a lentil meatloaf? Pesto made from home grown arugula? The famous carrot cake of Rogers Park’s own Sweet Atilla’s? 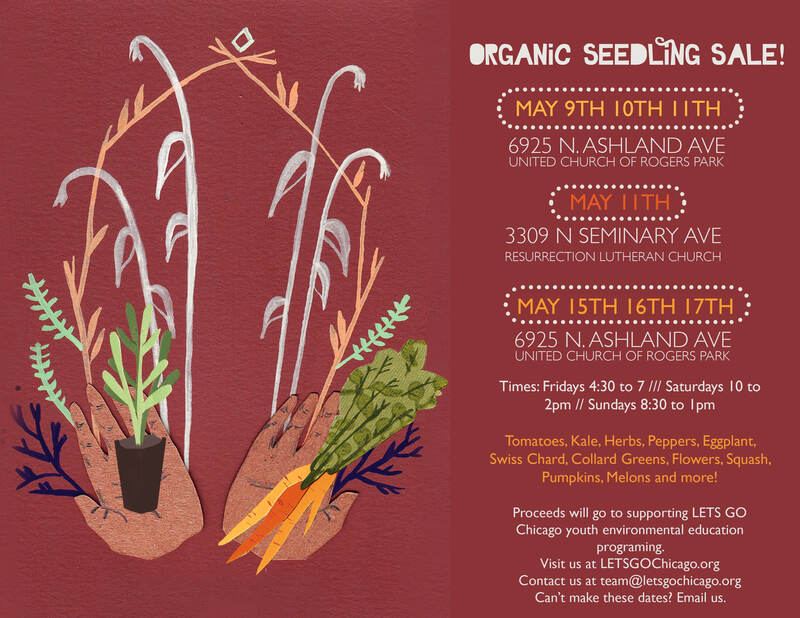 Please join us on Saturday, May 12, for three vegetarian courses featuring produce from our garden prepared by personal chef Amanda Schmies and served by LETS GO Chicago staff. And after you fall in love with the Sweet Atilla carrot cake, we’ll give you a gift certificate to use when you go by there yourself. A variety of donated goods and services from Rogers Park businesses will be up for bid in a silent auction. Goodies from The Coffee Shop, The Mustard Seed, Flatts and Sharpe, Clark Devon Hardware, and many other local supporters will be available, and other surprises are guaranteed. We’ll be opening the auction at 7 and serving the first course at 7:30. Seating is limited and tickets are $30 per person ($100 for four); RSVP to team@letsgochicago.org.